Whether you are missing all of your teeth or have teeth that need to be removed, you no longer have to settle with dentures. With over 99% success rate of dental implants, you can now enjoy the quality of life with implant-supported teeth. No more embarrassing moments and difficulty enjoying your favorite food or holding back smiling because of ugly teeth! Call today and see how dental implants can change the quality of your life. all consultations, diagnostics, X-rays, 3-dimensional computer-assisted planning, CAM /CAD surgical guides, necessary simple extractions, dental implants, transitional teeth, final restorations, and all follow-up and support. Complete loss of teeth and use of dentures is a crippling disease impacting the livelihood and quality of life. Patients can not eat well and stop smiling. With loss of teeth, the jaw bone also deteriorates rapidly. As the bone melts away your muscles migrate, or pull back, from their natural position. Your lips cave in as they lose support, and wrinkles increase dramatically as your facial structures collapse. The results are inability to eat, loss of confidence, embarrassment, and accelerated feeling and appearance of aging. You don’t have to live your life with such a crippling problem. Millions of people have benefited from dental implants supporting new teeth that they can use to chew better, smile more, and improve their overall quality of life. Lifetime Dental Implants is ready to help. Linda's Life Changing Experience After Getting Dental Implants from H. Ryan Kazemi, DMD on Vimeo. 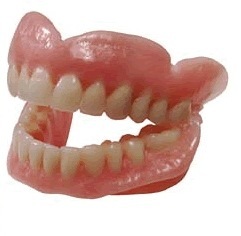 If you replace your missing teeth with dentures, you are compromising your facial structures. Dentures accelerate the bone resorption process as they put pressure on and compact the gums and underlying bone. As facial structures continue to collapse, the dentures must be relined (made thicker) to compensate for additional bone loss. 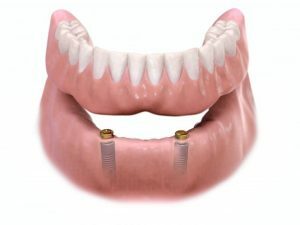 Replacing your teeth with implant supported overdentures (or bridges) will preserve the bone and prevent the further deterioration of facial structures and the related health problems that would normally occur with complete tooth loss. 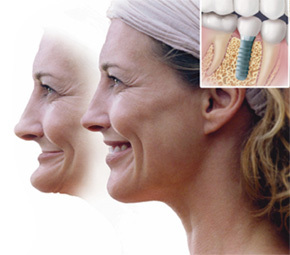 With very few exceptions, almost everyone can have dental implants and enjoy its benefits and added quality of life. Although you might have less bone from loss of all of your teeth, there are often adequate bone to position 2 to 6 or more implants for support of your new teeth. Age, osteoporosis, and inadequate bone will not limit you from getting implants and improving your chewing, smile, and overall life quality. Mrs. Smith had two dental implants placed during a 30-minute procedure under IV sedation, and was allowed to heal for 6 weeks before a new overdenture was made for her. It has attachments that fit over the implants and snaps into place. She has been using the new prosthesis for about a year and is very pleased and happy with it. She is social again and enjoying her favorite foods. She is saving money by not having to buy denture adhesives. Dental implants are now the standard-of-care for those with complete missing teeth. Implants preserve the jaw bone and prevent further shrinkage, and help support strong teeth that allow patients to eat better, smile more, and lead a more youthful lifestyle. There are several treatment options for dental implants for denture users or those who are about to lose all of their teeth. You may choose between a fixed or removable prosthesis, each requiring a certain number of implants and planning. 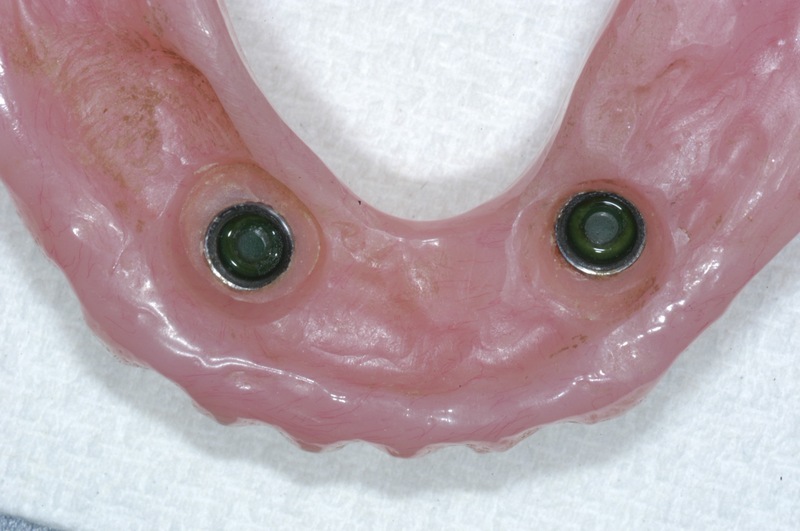 The fixed type of prosthesis may be designed as a hybrid or a bridge. 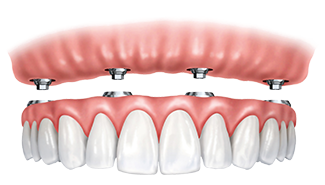 The number and position of the implants is based on your preferred type of prosthesis. 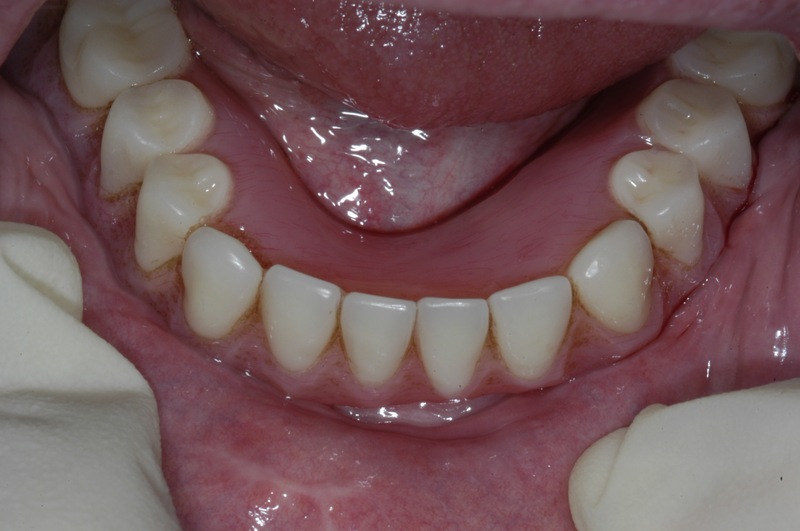 A removable set of teeth that may be supported by 2, 3, or 4 dental implants. A simple and less costly option to replace missing teeth providing good function and preserving the jaw bone from shrinkage. A full set of teeth which are fixed and completely supported by dental implants. 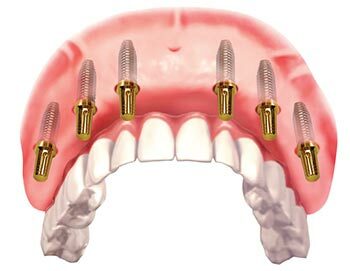 This design utilizes 4 to 8 dental implants depending on patient’s jaw anatomy and span of the bite. 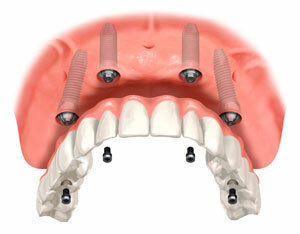 A conventional bridge supported by 6 to 8 dental implants. This option is possible when the bone has normal architecture and patient desires closest look and feel of natural teeth. All-on-4 concept is a fully fixed set of teeth on 4 dental implants. Variations of this design may be all-on-5 or all-on-6 resembling the design of a fixed hybrid prosthesis. This is a minimal design for a fixed set of teeth and may be appropriate for those with less available bone. ‘Same-Day-Teeth’ or ‘Teeth-in-a-Day’ refer to a treatment approach where a patient can have remaining teeth extracted with immediate placement of dental implants and delivery of an implant-supported fixed temporary prosthesis. Patient literally leaves the office with a new set of teeth on the same day. For those patients with significant loss of bone who don’t want bone grafting for conventional dental implants, mini dental implants may just be the right choice. Mini dental implants are significantly less costly and provide great support for dentures making it more stable and comfortable to chew with- no more denture adhesives! We use several current technologies that allows proper planning and dental implant placement for teeth that look great and can last a lifetime. CT scan and computer planning helps the implant surgeon and your restorative dentist place and restore the dental implants with high precision and accuracy. This translates into a better outcome, improved cosmetic results, and potentially lifetime longevity of the implants. What is CT-Scan Guided Planning? Proper planning and positioning of the dental implants with precision is vital to achieving highly cosmetic, functional, and long-lasting results. With our cone beam CT-scan along with 3-dimensional treatment planning, we can place the implants in the exact position required to support the overlying crown or other prosthesis. It also provides exact dimensions of the bone and surrounding structures such as nerves and sinuses, so that implant placement can be done with accuracy and safely. First, a special splint with radiographic markers is made before taking the CT scan. 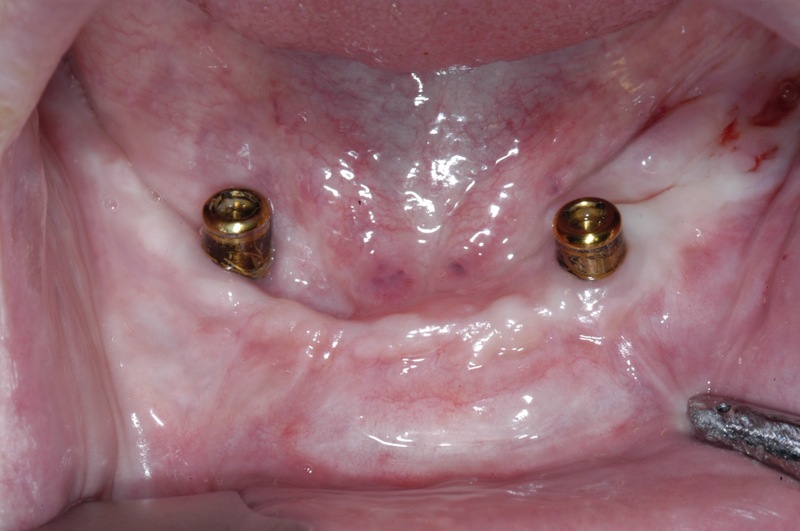 This splint is placed in the patient’s mouth while the CT scan is being obtained to demonstrate the required position of the implant and aid the surgeon in treatment planning. The CT scan images with the markers already captured, will demonstrate precise position of the implants, exact size of the bone, as well as location and proximity of vital structures such as nerves and sinuses. A CT scan may also be done without the radiographic marker. In this case it can be used to measure existing bone and evaluate other structures in proximity. The radiographic marker (also known as CT prosthesis) provides additional references for the surgeon and the restorative dentist when planning the treatment. Next the CT data is reconstructed into a 3-dimensional computer model. With a special software, the surgeon can now position the implants in the desired locations- all virtually. The correct width and length of the implants are selected to assure safe placement with respect to surrounding nerves and sinuses. 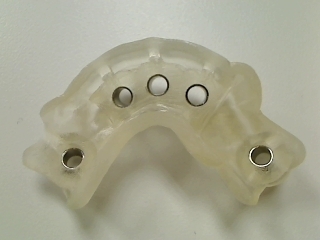 This 3-dimensional model can be easily shared with the restorative dentist to make sure they are positioned with precision for the support of future prosthesis. 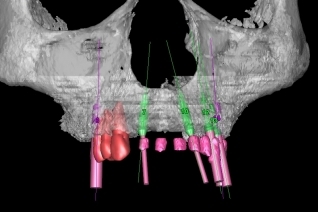 The computer dental implant work-up is then used to fabricate plastic surgical guides which will allow the surgeon to place the implants according to the 3-dimensional virtual work-up. The surgical guides are made to fit patient’s mouth with precision, therefore allowing the surgeon to position the implants exactly as planned. When is CT-guided planning recommended? 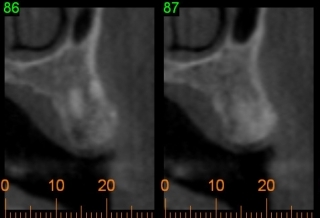 We recommend CT-guided implant planning in patients with full mouth implant restorations, those with highly aesthetic challenges, or patients with bone loss. CT-guided planning is not required in every patient as conventional planning and implant placement can be done with great accuracy and outcomes in many situations. Because of added cost, we recommend this type of technology and planning only when it offers great benefits to the patient and the ultimate outcome of the treatment. The initial recovery from most oral surgery procedures including extractions and dental implants takes 7-10 days. Most patients take a day or two before getting back to some routine activities. We offer IV sedation for optimal comfort during your procedure. Whether it is for teeth extraction or dental implants, IV sedation will provide you the most remarkable overall experience. Choosing the right team of dentists is probably the single most important factor in the success and longevity of your treatment. We have selected a team of expert dentists to collaborate with us to deliver our promise: Lifetime of eating better, smiling more, and living a healthier life. Information on treatment fees, insurance benefits, and payment plans to make treatments possible for everyone. So you have complete missing teeth or about to loose the remaining teeth and don’t know how to proceed. You have questions on the best treatment approach and which type of teeth best meets your needs. And of course want to know how much it costs and which option is most affordable. Your next step is to learn about treatment options. Complete fee packages include all consultations, diagnostics, X-rays, 3-dimensional computer-assisted planning, CAM /CAD surgical guides, necessary simple extractions, dental implants placement, transitional prosthesis, final restorations, and all follow-up appointments. Necessary bone and soft tissue grafting and anesthesia fees are separate and added based on need. For both upper and lower full arch treatments, we offer a combined discounted fee. Contact us for information.